In my current example, the player can walk over a slowly rotating platform, so it's current viewing angle should change accordingly like in real life. This works well in non-VR. In VR, however, the current viewing angle seems 1:1 mapped to the headtracking-data. So the platform rotates but the player is continuously facing the SAME direction (which is wrong of course). So, can you at least confirm that this is a bug...? 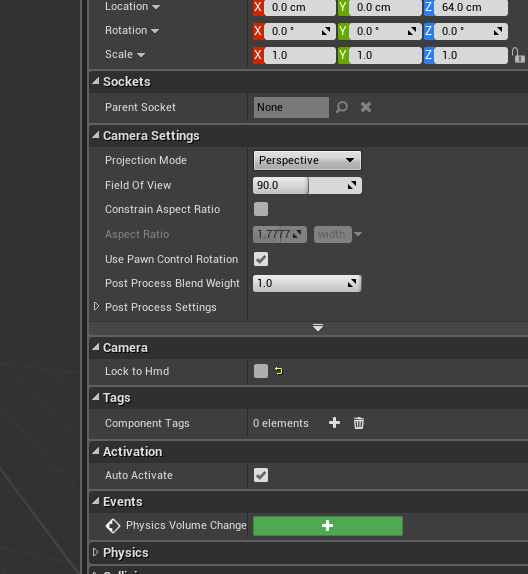 UE4s default player controller scales all yaw values with 2.5 for whatever reason which screws up pretty much all rotation commands in my project. 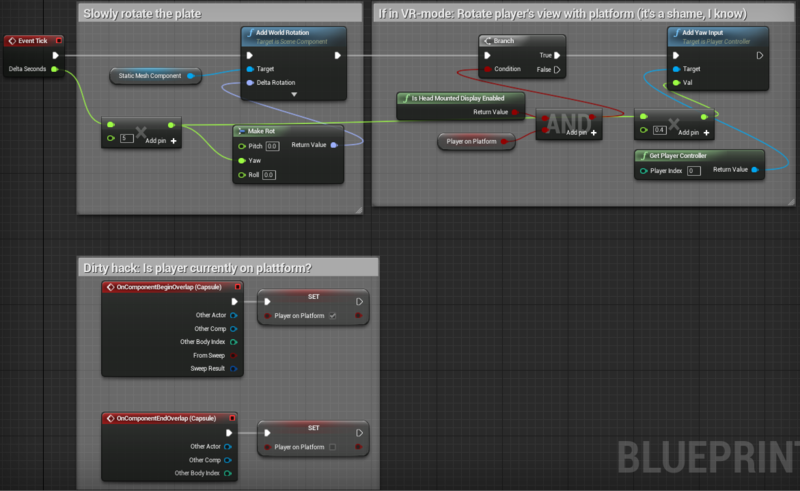 Create a new BP and derive from "PlayerController". PinToolTip="Follow Hmd Orientation\nBoolean\n\n(in) True if camera\'s orientation should be updated by most recent HMD orientation." PinToolTip="Follow Hmd Position\nBoolean\n\n(in) Whether the camera\'s position should be updated by most recent HMD orientation or not." PinToolTip="Return Value\nPlayer Camera Manager Reference"
PinToolTip="Retrieves the value of the variable, can use instead of a separate Get node"
Don't get why we need all these nodes except last one? And why we are enabling follow HMD orientation? I know it works but don't get why that flag has inverted logic? Long story short: It's pretty much broken right now. See https://forums.oculus.com/viewtopic.php?f=60&t=24683 for reasons. Once I remove the blueprint everything works fine again. I use unreal 4.10 and the Oculus SDK 0.8.0.0. Does anyone have a solution for the problem? You need to recreate that blueprint manually using the blueprint editor rather than pasting that text. Seems like pasting may work only while you stay on the same version of UE. Thanks for the superfast answer. I did recreate it by manually building it with the blueprint editor. Do you have any other suggestions? Thanks again for the answer! I did a bit of testing and found out, that the problem I described occurred when you use the first person c++ template. With the blueprint template it works. Not sure if that can be considered a bug or if I really just shouldn't mix C++ with blueprints. Seriously, is there any none left who fully understands all the different working, partially- and non-working rotation-options? AFAIK followHmdPosition still doesn't work in the camera manager. First, deactivate "Lock to HMD" in the camera you are using. 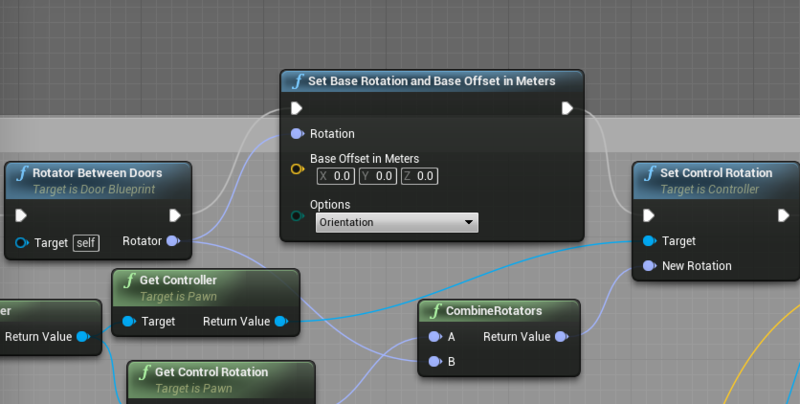 Now, whenever you want to rotate the HMD you have to use the function "Set Base Rotation and Base Offset in Meters" with the parameter rotation... obviously. How do i rotate a camera attatched to spring arm?